Referred to as 'cot death' or 'crib death', sudden infant death syndrome (SIDS) is a medical term used to describe the unexplained and sudden death of a child under age 1. More importantly, an autopsy does not reveal any explainable cause of death. The pity here is that most victims of SIDS appear healthy prior to death. In most instances, the babies typically feed normally prior to being put to sleep in bed. 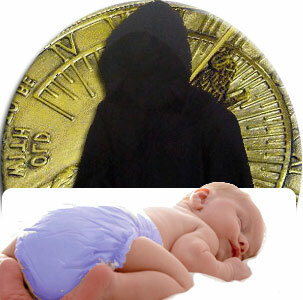 The infant is suddenly discovered to be lifeless, without any pulse or respiration. Even if cardiopulmonary resuscitation (CPR) is initiated, evidence shows no benefit from it. Statistics reveal that SIDS affects around 7,000 babies in the US each year. SIDS is suspected when a healthy infant who is younger than 6 months is found dead in bed. SIDS is rare during the first month although it peaks between 2 and 4 months of age and it seems to occur in infants younger than 6 months of age. SIDS can affect boys more than girls. Most SIDS death occurs in winter. Sleep arousal which means problems with the baby's ability to wake up. The baby's body is unable to detect a buildup of carbon dioxide in the blood. When babies are born in multiple birth, such as twins or triplets. Anemia may by a cause, although it cannot be evaluated at autopsy as hemoglobin can only be measured in living infants. Mold can cause bleeding in the lungs that may be fatal in infants. The SIDS death rate in infants with low birth weight is comparatively more than normal weighing infants. A study released in Britain revealed that common bacterial infections (staphylococcus aureus and Escherichia coli) appear to be risk factors in some cases of SIDS. A study in the Journal of American Medical Association reported that babies who die of SIDS have abnormalities in the brain stem - underdeveloped serotonin receptors which help to control various functions such as blood pressure, breathing and arousal. Yet another study reveals that a possible cause of SIDS could be parents leaving their infants in an angled position, 'Trendelenburg' position. This can cause brain stem to fall. In severe cases, the brain gets 'crushed'. In some SIDS death, intense immune reactivity in brain stems was found, which could be responsible for decreased cardio respiratory and arousal responses. Upper cervical spinal injury, which could have occurred at birth due to infant's head traumatically turning from side to side, is another factor to be considered. Difficulty in breathing is a classic sign of upper spinal cord and brainstem injury. Records of hearing tests in infants who died of SIDS indicate that there were differences in the pattern of Oto acoustic emission tests compared with normal babies. SIDS may be related to high levels of acute outdoor nitrogen dioxide NO2, exposure during the last day to life. This can be a causal factor to the occurrence of SIDS. In almost all instances, SIDS happens without any warning, sign or symptom. Most of the time, the infant is thought to be sleeping. Infants could experience Life threatening events (ALTes) in which abrupt changes in their breathing, color and muscle tone can be detected. Viral respiratory infection, gastroesophagael reflux or seizure could be causes for ALTes. But there is no definite scientific evidence to link ALTes and SIDS. An autopsy does not confirm the cause of death. Probably, they may help add to the existing knowledge of SIDS. In most cases, as the death is sudden and unexplainable, the state law requires an autopsy to be done. The American Academy of Pediatrics recommends the following guidelines to prevent SIDS from occurring. It is always best to put an infant to sleep on its back in a supine position. Never put the infant to sleep on its stomach. Side sleeping is unstable for infants and should be avoided. To prevent a 'flat spot' due to sleeping in one position, the baby can be allowed to roll around its tummy while awake. Infants should never be allowed to sleep in bed with other children or adults. Never put the infant to sleep between parents. Do not put an infant to sleep on surfaces other than cribs, like a sofa. It is better that the infant sleeps in the same room as the parents. Soft bedding materials should be avoided. Babies should sleep only on a firm, tight fitting crib mattress with no comforter. It is advised to use light sheet to cover the infant. Pillows, comforters and quilts should be avoided. The room temperature should not be very hot. It should be comfortable for a lightly clothed adult. A baby should not be too hot to the touch. SIDS can be reduced if pacifiers at nap time and bedtime are used. Doctors opine that a pacifier might allow the airway to open more and prevent the baby from falling into deep sleep. The premise here is that if a baby wakes up more easily, it may automatically move out of a dangerous position. If the baby is breast fed, it is best to wait for a month before offering a pacifier. The pacifier should be used when placing down the infant for sleep and it should be inserted once the infant falls asleep. Pacifiers should not be coated in any sweet solution. It should be cleaned often and replaced regularly. Although electronic respiratory and cardiac home monitors were used some years back to monitor apnea or breathing, especially in families with a history of SIDS, research has found that use of home monitors has no effect. The baby should be kept in a smoke free environment. Breast feeding reduces chances of upper respiratory infection which may influence the development of SIDS. Honey should never be given to a child below age 1 as it can cause infant botulism which is associated with SIDS. Vaccination does not increase the risk of SIDS and it may reduce the risk, though slightly. Using a fan to circulate air correlates to lower risk of sudden infant death syndrome. A sleeping baby is prone with nose to the sleeping surface and could re breathe some of its exhaled breath which is enriched with CO2 with depleted oxygen; whereas, a fan could increase the exhalation into the room and lessen the risk of SIDS related to infant hypoxia. Maternal smoking during pregnancy is a major risk factor in almost every epidemiologic study of SIDS. Smoke in the infant's environment after birth has also emerged as a separate risk factor in some studies. As the risk of SIDS is reduced if the infant sleeps in the same room as the mother, the crib or cradle of the baby should be close to the mother. Infants should be lightly clothed for sleep. Over bundling the baby should be avoided. Avoid the infant having to spend excessive time in car seat carriers and bouncers in which there is pressure applied to the occupant. Upright cuddle time should happen. In case your infant is not moving or breathing properly, please rush to the doctor. Never wait. Above all, it is better that parents of infants are trained in CPR. Those parents who have lost a child to SIDS need emotional support. The National Foundation for Sudden Infant Death Syndrome assists with counseling and reassuring the parents and families of SIDS victims. Since there is no cause for death, parents are most often left with a feeling of guilt. Family counseling is recommended to help the siblings and other family members cope with the loss of the infant. It is important for parents to understand that SIDS is neither predictable nor preventable. SIDS is neither caused by immunization nor by bad parenting. SIDS is neither contagious nor hereditary. There is a gradual expansion of medical knowledge on SIDS, although definitive diagnosis remains difficult. This is the reason why infanticide and child abuse cases are often misdiagnosed as SIDS. Accidental suffocation is also misdiagnosed as SIDS. First Published Date: 10 May 2012 Last modified Date: April 22 2019 This page may have been updated recently as new information is available or the content may have been edited for better readability.